Here is Chris Hunter's biography in his own words. "I was born in the Lower Ninth Ward on Roman street and went to John McDonogh 19 Elementary, where i first discovered my talent for art. When I was in the secont grade the teacher put some vegetables in front of the class and asked us to draw them, and when I finished - all the kids gathered around and were staring at my drawing. I asked the teacher "Why are they looking at my picture?" and the teacher said - "Go and look at their pictures!" I did, and teacher asked "What do you think? ", so I said "They can't draw! ", because they just draw simple shapes, and my picture had all the little details...So that's how I became the Class Artist...In third grade I won 3d place in all-school Science Exhibit for a drawing about the life of insects, and the same year I won the first place in St.Ramond Art Contest. I painted all the backdrops and scenary for my graduation Ball in 9th grade. When I was in high school I won John Mc.Donogh High School "Most Creative" title in both sophamore and junior years." "I went to Southern University where I majored in fine and commercial art, and took a lot of sculpting classes. To pay my tuition I got a job in the kitchen of Mariott Hotel - that's where I first got interested in ice sculptures, I was watching the chefs doing ice carvings for the buffet and learned the technique. 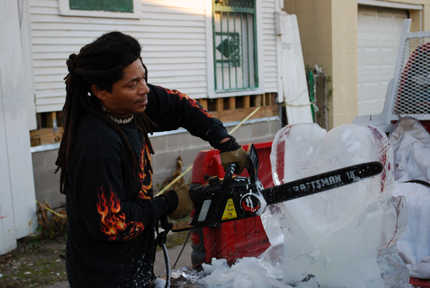 The first ice carving I did myself was for the Grand Opening of the Superdome...and got hired right away by Fairmont Hotel as a contract ice-sculptor, I was doing 2-3 functions a week for them for many years. I became so good at it, that while still in college, I was asked by Delgado Community College Culinary Department to teach ice-carving to their students." 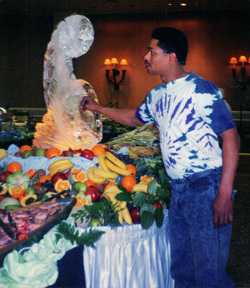 " I worked for Fairmont Hotel for 20 years, doing both ice and lard/butter sculptures. 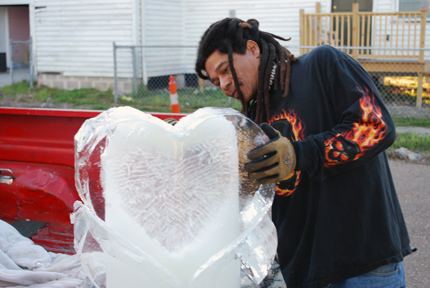 I was hired by Superdome Food services to carve both ice and tallow, lard sculptures. I won 'The best of the show" for my tallow sculpture of a jazz band. I also did pumpkin carvings and won the Grand Pumkin-Pomkin carving contest at Fairmont Hotel in New Orleans. For many years I was the most experienced ice carver in the city, so I was really busy, doing 8-10 sculptures a week - weddings, banquests, hotel functions, my phone was ringing all day long..."
"I stayed in my Gentilly house during Katrina and I had a boat, so I paddled my neighbours to safety when we got flooded. I also fed 20 cats people left behind...I drunk some flood water and got really sick, they flew me to San Antonio TX where I was in a hospital for a while. I could stay in San Antonio, they have a lot of hotels there I could work for and I was offered a job and free housing as Katrina victim, but I decided to come back and rebuild, New Orleans is my home! Now I am working on my house and still doing ice sculptures in my favorite city. I feel blessed that I can make a living doing what I love and be a part of the best culture in the whole world!" 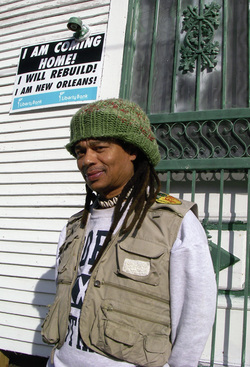 Here's recent picture of Chris Jazzy Hunter with his sculpture at the Witch Doctor's Zulu Ball in the Mardi Gras Zone. 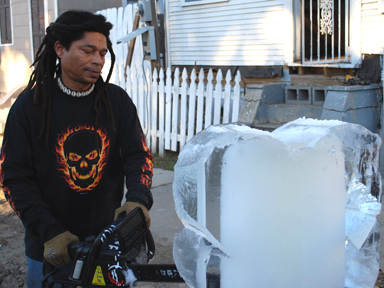 Below is a picture of Chris on the steps of his Gentilly house, which he is still rebuilding after Katrina, and some pictures of ice-carving in progress.